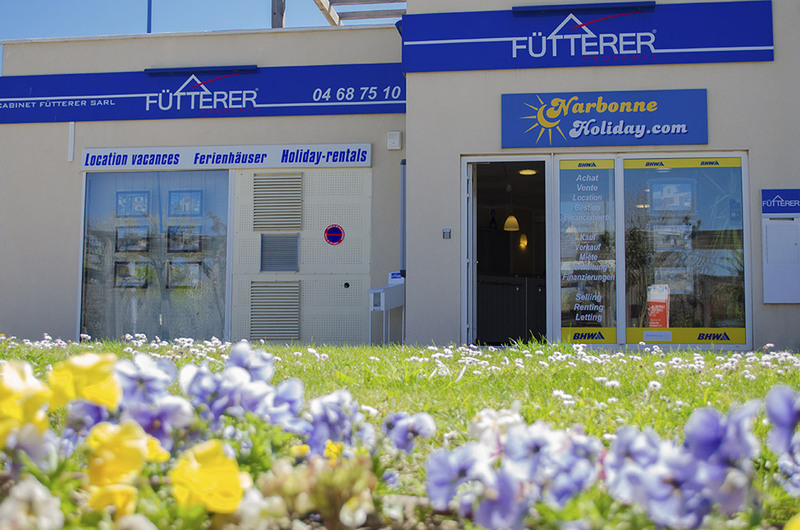 The Fütterer Agency and its team have been situated on the Audois coast since 1998. We offer a wide range of services, from real estate sales, rental management and holiday lets, to co-ownership management. We provide these services for all types of property : houses, apartments, lofts, garages, new-builds, commercial premises and plots of land. The Fütterer Agency is a member of the National Real Estate Federation (FNAIM) which is the N°1 federation for Real Estate professionals in France. Membership of the FNAIM is a real commitment on a daily basis to client satisfaction and professional ethics. The following communes are covered by our offices : Narbonne Plage, Saint-Pierre-La-Mer, Gruissan, Gruissan Les Ayguades, Narbonne, Vinassan, Armissan, Fleury d'Aude et Salles d'Aude. Our team is an essential partner for all types of project: property purchase, sales, yearly rentals, holiday lets as well as co-ownership management. 2 offices at the heart of the Audois coast. The headquarters are based in Narbonne-Plage, 5 Place de la Méditerranée. We welcome you from 9.30am to 12, then from 2.30pm to 6pm. Gruissan Les Ayguades Agency is situated in the shopping centre Supergruissan, Les Ayguades, 11430 Gruissan. The Audois coastline is among the most beautiful in France. The region offers amazing scenery and a variety of protected fauna and flora. The region also has a rich Roman history which provides some great opportunities for cultural excursions to the Cathar Castles. A dynamique, multilingual team to welcome you in French, English or German.